a 'Primrose' has 1 stem with 1 flower on top. 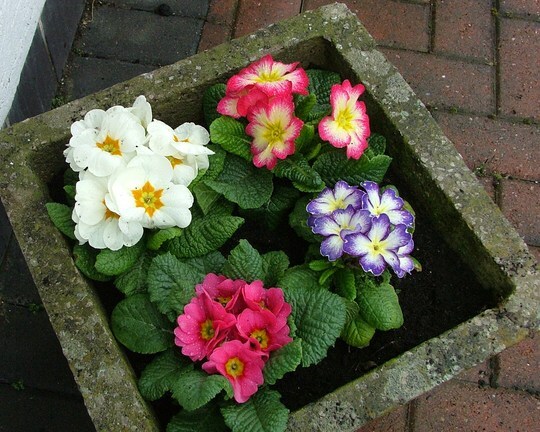 a Polyanthus' has 1 stem with many flowers on top. Correct me if I'm wrong, anybody else think the same ? Glad your son is enjoying his job, Sanbaz, and that your getting some benefit too :) Lovely pot of colour. Great selections. Glad to hear your son is doing well at his new job. What Mega 75 say is correct Primrose has a stem for each flower, Polyanthus has one stem and many flowers, most of course produce more than one stem on the plant. and we now now get a Primrose that part way through its flowering will send up a Polyanthus stem with a group of flowers head and shoulders above the original, and vise versa where a Polyanthus reverts back to Primrose. Your original heading Primrose or Primula they all belong to the same family, the word Primula is usually reserved for a species of such as Primula Denticulata, or our Cowslip which is Primula Veris. Hope this makes sense it can get quite involved. I've Primula obconica many flowers on one stem, bred in Germany to lower the irritant found in most primrose that gives a rash from handling. It has very unusual leaves. Breeding is definately changing these very quickly. Great description Brian. What ever they are called looks lovely, and so pleased Joe is doing well. very colourful Sandra do you think they will come up every year? Whenever I have tried some they are OK after I planted them but don't seem to come up and flower again the following year.